The 2018 VW Tiguan debuts in late July. Passat sedan and the all-new Atlas SUV. Volkswagen’s rejuvenation continues apace, with its second all-new SUV this year set to arrive later this summer. The 2018 Volkswagen Tiguan launches this compact SUV’s second generation, a model that is larger, updated and offers the latest technologies. 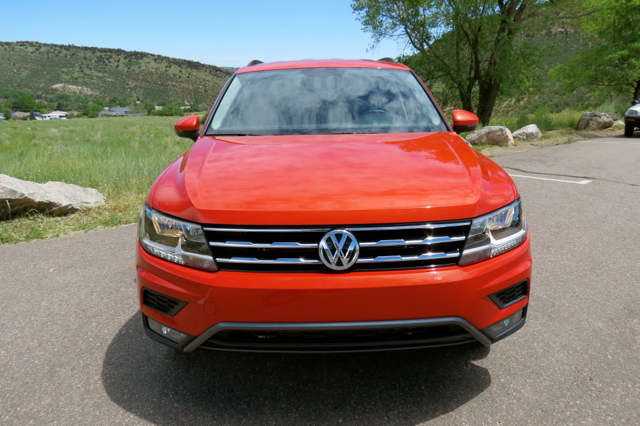 The 2018 Tiguan (pronounced tig-wahn) follows the 2018 VW Atlas to the market, giving Volkswagen a strong 1-2 punch in the continually expanding SUV segment. VW still has the low-volume, five-passenger Touareg SUV, but the company hasn’t said whether it will return for another model year. The Tiguan along with the Golf and Atlas are each based on Volkswagen’s MQB platform. As a modular platform, MQB may be infinitely resized to accommodate a variety of vehicles and powertrains. The upfront costs are steep, but long-term gains come from expanding MQB to multiple models. 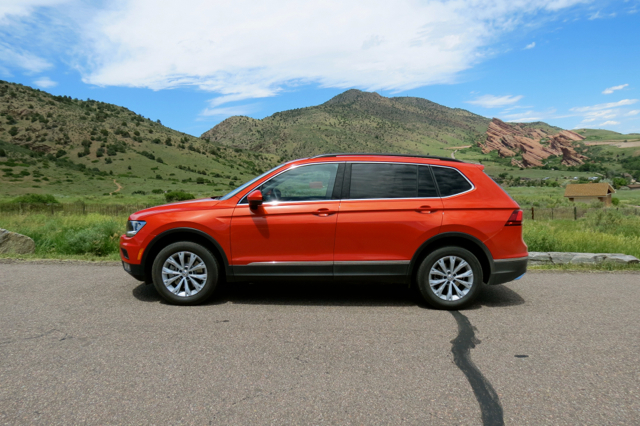 At a press event held in Denver, Colorado, and attended by this writer (Volkswagen covered the airfare and hotel accommodations to make this trip possible), company representatives took turns explaining what the Tiguan is about and VW’s outlook. 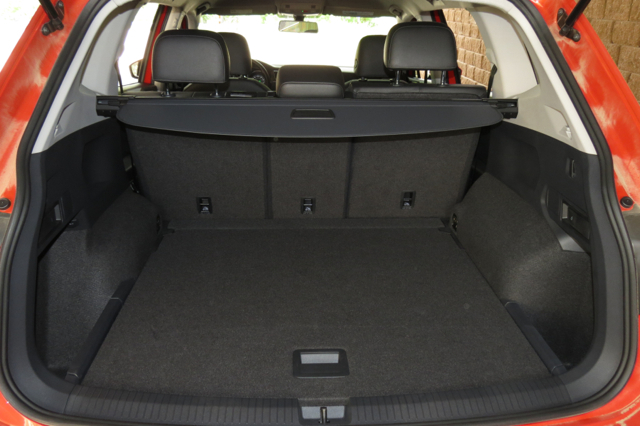 one of the largest SUVs in the compact range. Once again, Volkswagen acknowledged that it needed to regain customer confidence, lost when a 2015 diesel scandal revealed widespread cheating. The automaker paid billions of dollars in fines, repurchased affected vehicles, and fixed others. A company spokesperson explained that the automaker could regain customer trust by building good product. At the base of the center stack (northwest of the water bottle) is the Tiguan’s drive mode select dial — standard on 4Motion AWD models. Enter the 2018 Volkswagen Tiguan. The first-generation Tiguan was a bit player in the market, easily outsold by nearly every model, including the Honda CR-V, Ford Escape, Toyota RAV4, Nissan Rogue, Chevrolet Traverse, and others. When introduced in 2009, the market was already shifting to larger compact models. Unfortunately, the original Tiguan was one of the smallest in its class — size matters and customers shopped elsewhere. The original Tiguan’s shortcomings served as a lesson for the automaker, something taken into account while developing a new model. Indeed, the company looked specifically at the US market and decided to redesign and engineer the next Tiguan with the American consumer in mind. That decision produced a model that is 10.6 inches longer, with much of that gain apparent between the wheels. Instead of being the smallest SUV in the compact range, the 2018 Tiguan is now one of the largest. And so much so that the front-wheel drive models automatically include a third-row seat with the extra row serving as a $500 option on all-wheel drive models. Volkswagen offers the 2018 Tiguan in four grades: S ($25,345), SE ($29,080), SEL ($32,550), and SEL Premium ($36,250). Add $900 for destination and another $1,300 for all-wheel drive. All 2018 Tiguan models have a single powertrain offering. A 2.0-liter turbocharged four-cylinder engine with 184 horsepower and 221 pound-feet of torque moves each one. Volkswagen says the updated engine features a modified Miller cycle for greater efficiencies. Fuel economy is now 22/27 mpg city/highway, up from the previous 20/24. 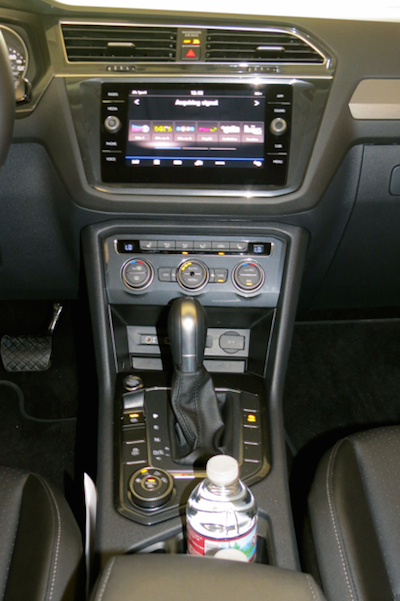 Also helping matters is an all-new eight-speed transmission, offering two additional gears than before. soon to be pushed to the limit. Volkswagen held nothing back when mapping drive routes for us follow. I teamed with Derick Page of Black Book, taking turns behind the wheel as we embarked on a pair of 50-mile drive segments. In Denver, you’re already starting your drive at a high elevation — the Cherry Creek section of the city measures 5,358 feet, just above the 5,280-foot “mile high” designation. Our initial trip started out on the interstate before connecting with Colorado SR 36 pushing through Boulder. The real fun began when we made our ascent through Rocky Mountain National Park on two-lane roads with some of the most amazing scenery in the west. As we climbed ever higher, the valley below faded to near nothingness. Yet we remained thousands of feet below several distant summits (including Longs Peak), still snow-capped even as our local conditions neared 90 °F (32.22 °C). Volkswagen supplied us with sufficient warning that the paved roads would eventually give way to gravel and just like that they did. Our test 4Motion with Active Control (all-wheel drive) features four settings — on-road, snow, off-road and custom off-road. A quick switch to the off-road setting provided improved handling management, especially as we edged perilously close to the side with no guard rails and only thin forest present to slow what could have been a deadly descent. 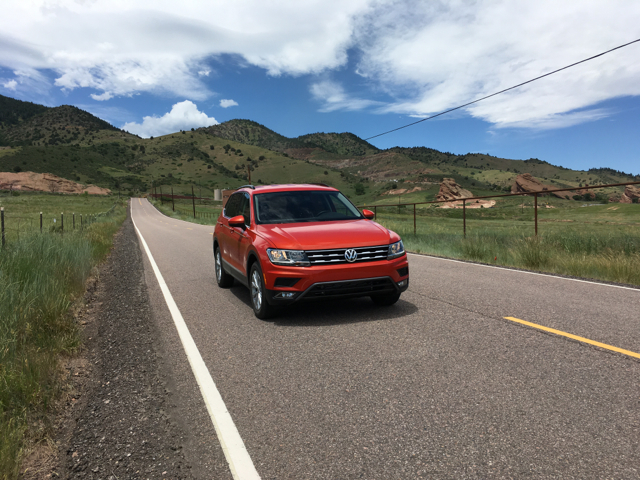 Under most conditions, the 2018 Tiguan’s engine performed admirably, although on the steepest inclines it labored a bit. We topped out at 8,018 feet with the turbo adjusting just fine to the thinner air. Steering is sufficiently weighty, handling adept, and the firm brakes quickly brought our Tiguan to a firm stop. Morrison, Colorado, seemed much more manageable. 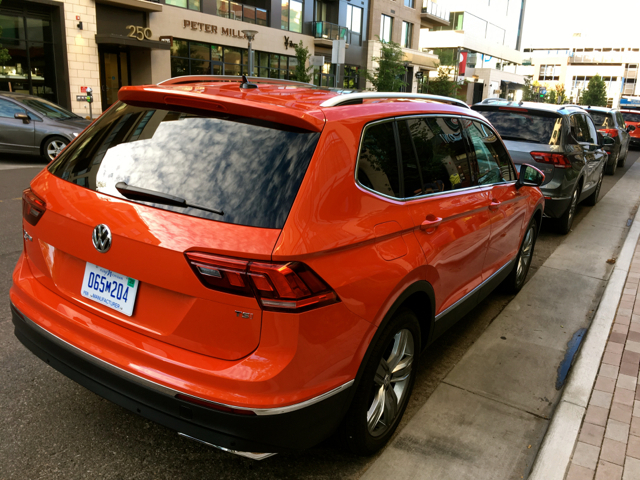 My first impressions of the 2018 Tiguan were mostly favorable. Then again, we had access only to well-equipped SEL models due to time constraints which meant that we gave the S and SE trims only a cursory inspection. That said, the new Tiguan offers an exterior look that is more polished and upscale than before and an interior supplying a healthy mix of premium and common materials. On the tech front, the only fault we found was the size of the screen, but it still offered a clear presentation. I’m familiar with VW’s Car-Net connectivity system and I like its usefulness. As for the third-row seat, consider it sufficient for youngsters, although cramped legroom is in the offing. 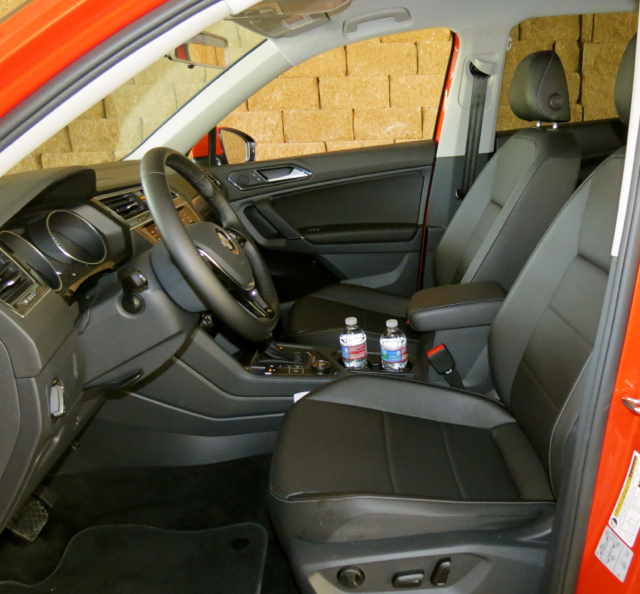 If you choose the all-wheel drive model, it may not be worth the $500 investment to gain the extra seat. Otherwise moving up to the midsize Atlas supplies the best balance of passenger and utility space for large families. 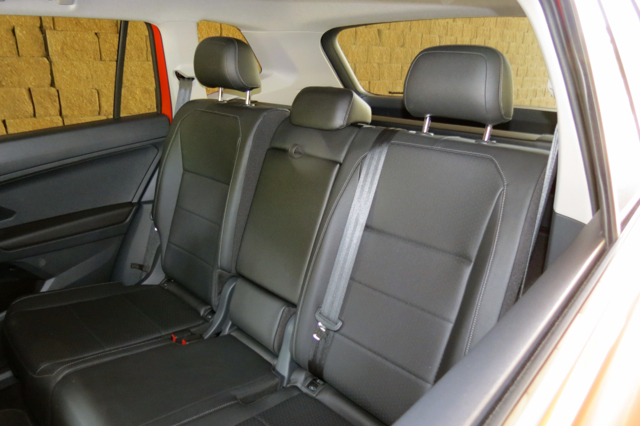 The 2018 Tiguan offers comfortable front seats with a smartly laid out interior. There is ample room for three in the second row. choose *not* to opt for the third-row seat.